Halloween is one of my favorite holidays! All the lovely costumes, parties, and all that delicious candy. 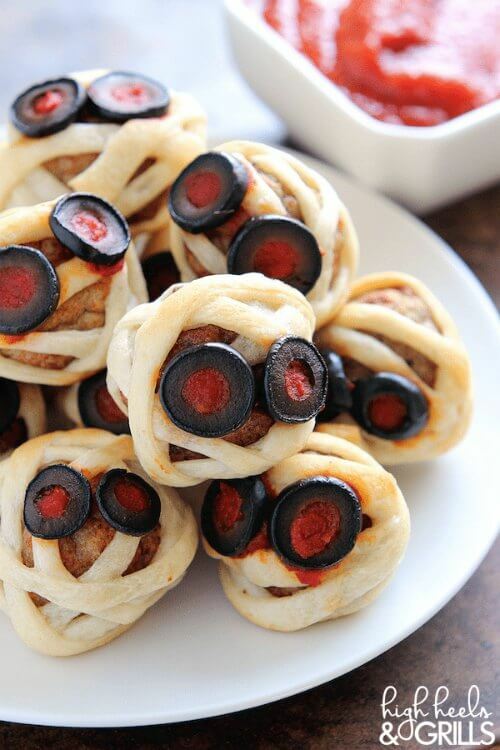 Halloween parties mean finger food, and who doesn’t love a delicious appetizer? We have so many ideas for you that you are just going to love! Try these 15 wickedly good appetizers to get your Halloween party started! Guests will rave about all of this delicious food that is also so creative. 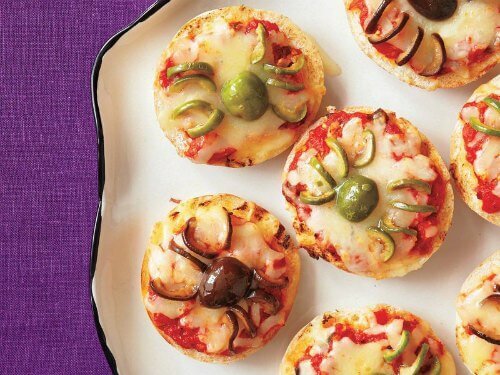 Here are 15 Halloween snack ideas that are perfect for parties. These ideas are so fun! I’m sure these Halloween snacks will be a huge hit! If you are looking for Halloween food ideas for adults with pictures, take a look at these recipes. These recipes are so festive and really very simple and inexpensive to make. You can spend more time enjoying the party instead of being stuck in the kitchen! 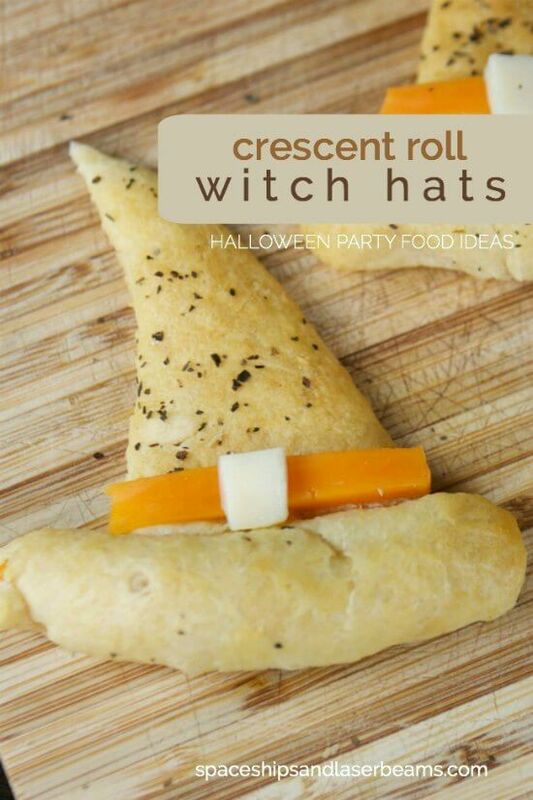 Creative Halloween Appetizers do not have to break the bank! These budget friendly recipes leave a big impact on your Halloween party without a lot of work or expense. 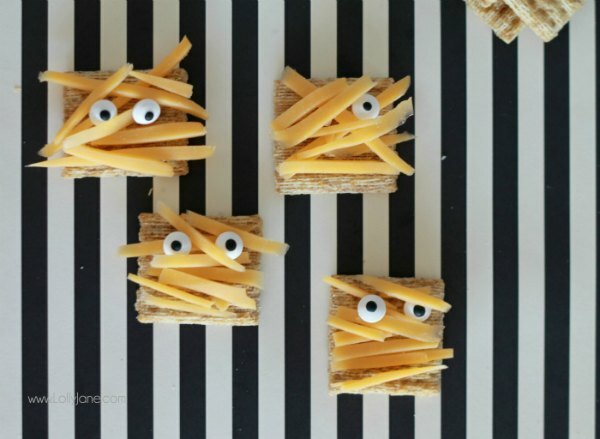 Layer cheese on crackers to make this mummy appetizer. The googly eyes make them so fun! This is so cute! 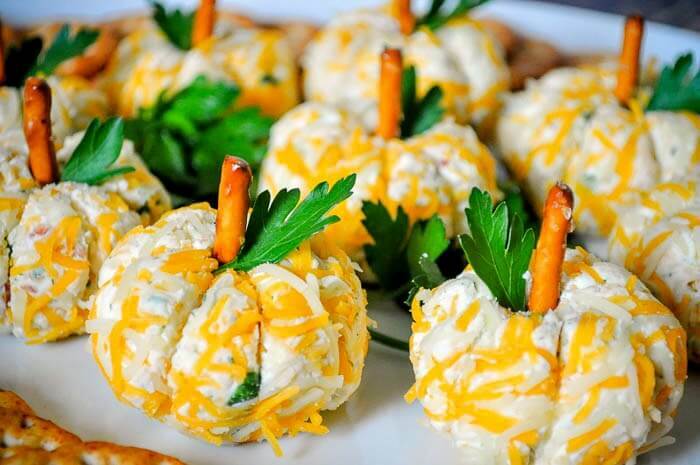 Make individual cheese balls and turn them into pumpkins. 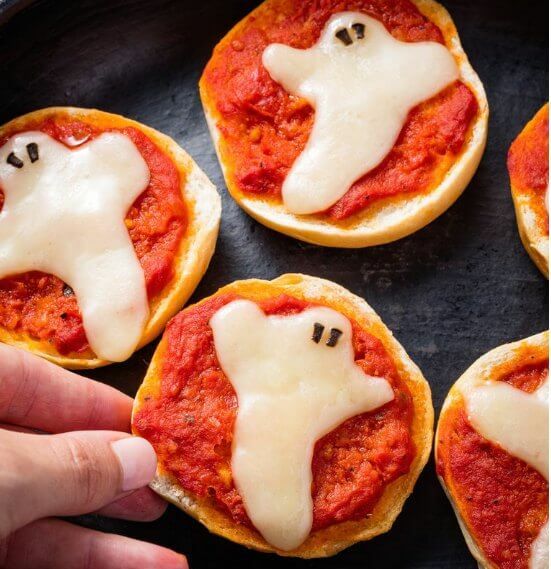 Use cheese to make ghosts on these pizza bagels. So clever and fun to eat. Spread guacamole dip into “Frrankengauc”. I love the chips used as “hair”. Wrap meatballs to make them look like mummies. The even have olive “eyes”. So fun! 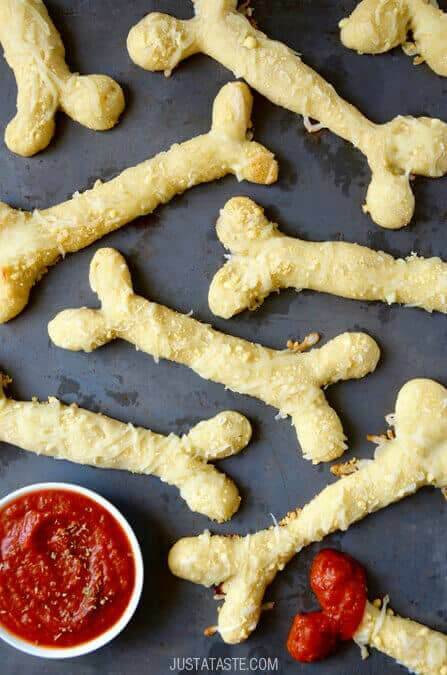 Twist bread sticks into bone shapes for this festive dish made complete with marinara dipping sauce. 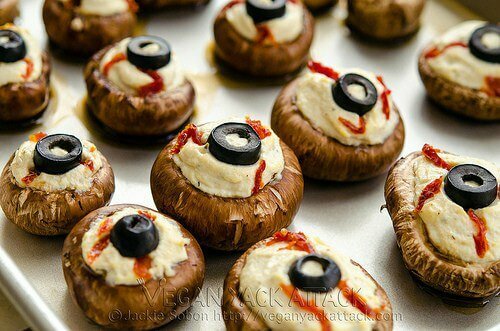 These are the perfect appetizer for a Halloween party. 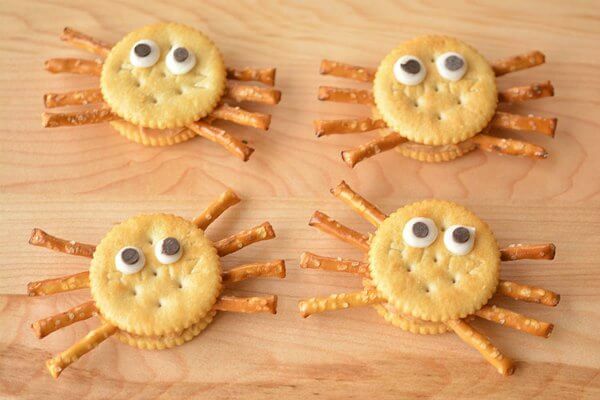 Pretzels make cute little spider legs in these Ritz cracker snacks. So fun and tasty too. 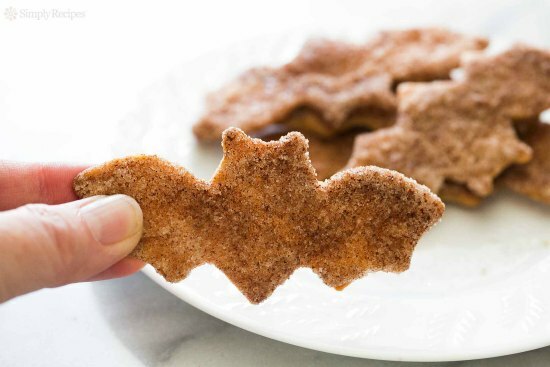 This is so quick and easy and kids will love all the cinnamon and sugar. You can use any shape you want. I think pumpkins or a jack o lantern would be cute too and tasty with a peanut butter dip. 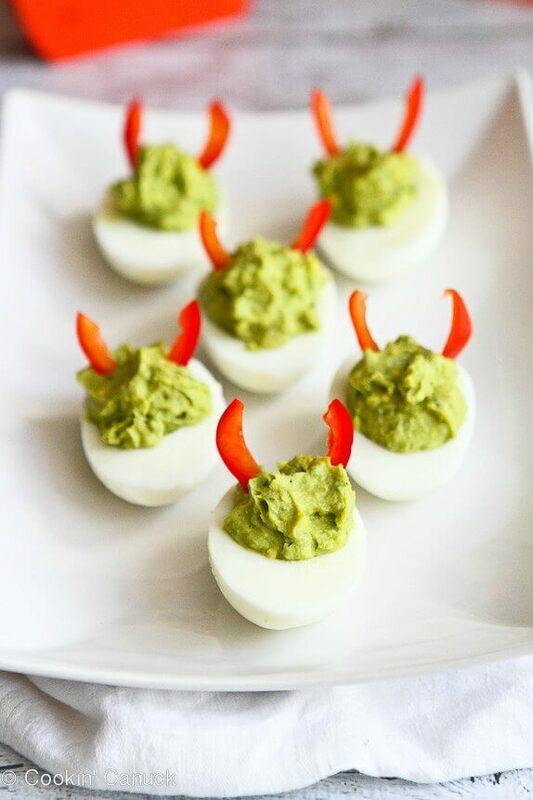 Turn a classic deviled egg recipe into a Halloween appetizer with these fun ideas. Plus eggs are so budget friendly. The Buffalo Chicken is such a festive shade of orange and so decadent with cream cheese spread. It will go perfectly with your Halloween treats. This dip is so good and it look so cool as a spider web. Grab some tortilla chips and you are set. These are homemade but I bet you could use store bought in a pinch and decorate to look like spiders. Either way, they are so neat looking. 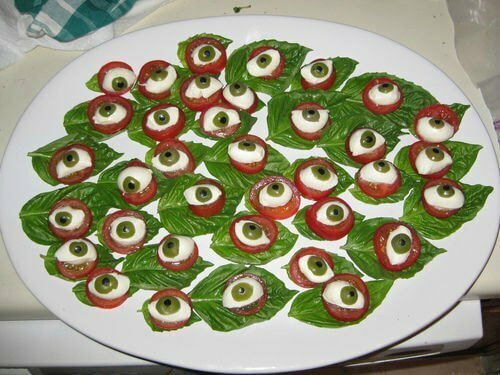 Layer all the caprese ingredients for a clever eyeball appetizer. Adults will love this one. Pumpkin seeds would also work in the layers. Kids will love how this looks and it’s pretty tasty too. These will be gobbled up quickly. 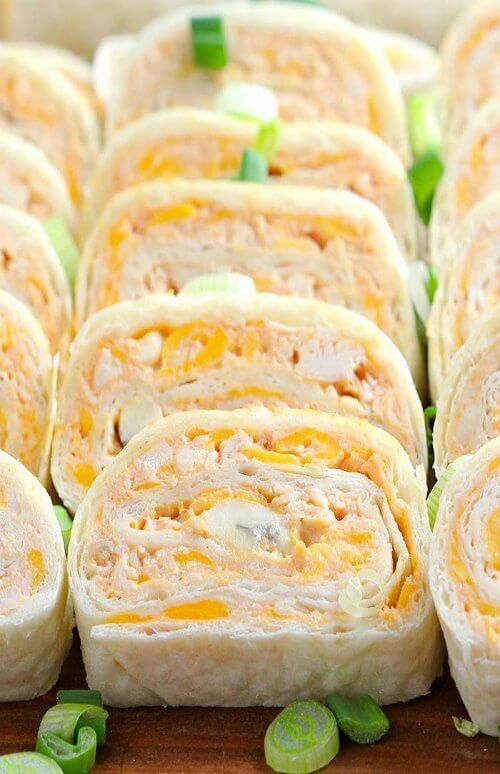 Everyone loves crescent rolls and this appetizer is such a cute idea. The cheese makes these even more yummy. 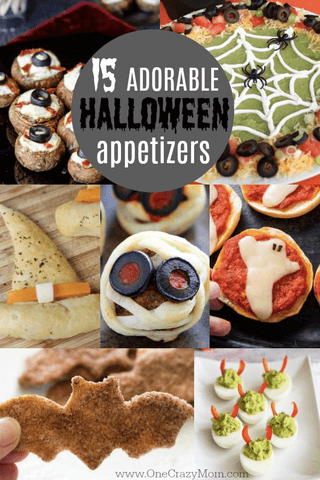 These appetizers for Halloween party look so festive and they are delicious too! Share in the comments what your favorite Halloween snacks are. And if you have any Halloween snack ideas, please be sure to share! If you need ideas for games, take a look at these Halloween party games for adults. It can be hard to come up with ideas for games for adults and these are so fun. Find 5 Halloween games for adults they will love. Now you are all set on Halloween Appetizers Recipes! Your Halloween Party will be a success. I bet it might even become an annual tradition. 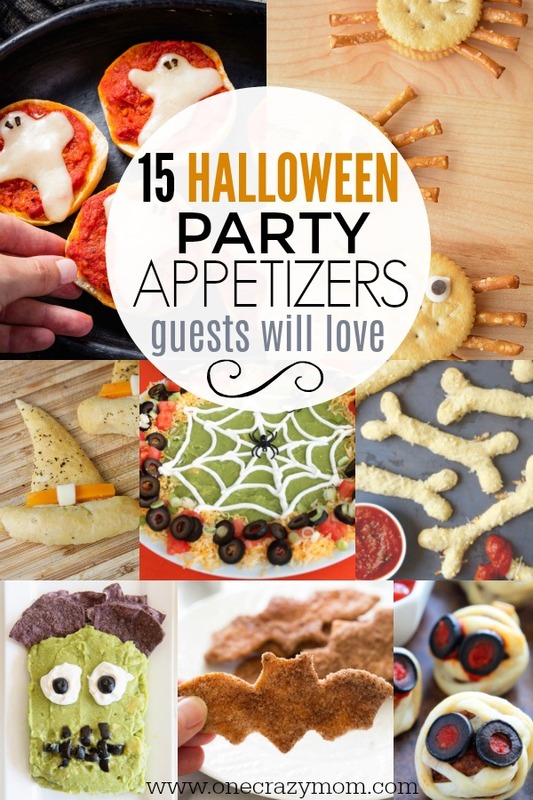 Guests will love all these yummy Halloween finger foods. Don’t spend a ton of time and money. If you need some filler items, put out a few bowls of snack mix for easy Halloween party ideas. You can make quickly and easily make several spider decorations that will really help set the mood for your Halloween party. No need to spend tons of money with these festive and easy ideas. 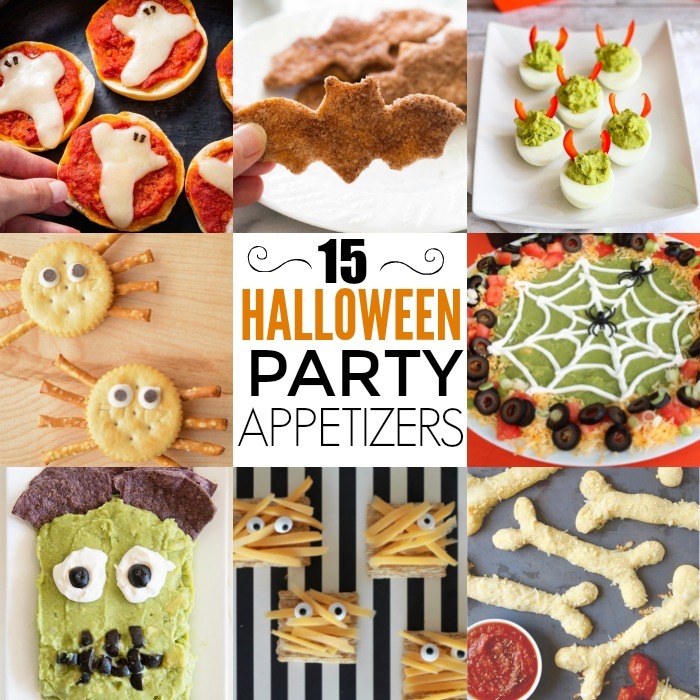 Combine a few fun decorations with these Halloween Appetizers Adults will love! Halloween party food is one of my favorite things to make. 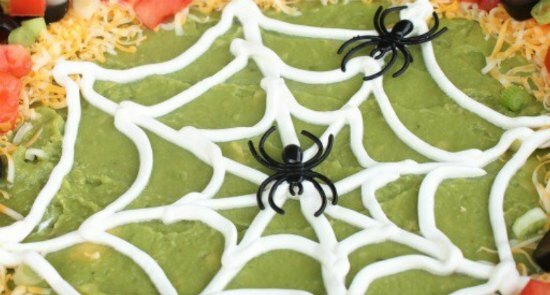 Try some of these creepy Halloween food ideas! We love to try a few new recipes every year and incorporate them into our regular menu. So fun! It is amazing how festive and pulled together a party can look with a few well placed and creative appetizers. Don’t underestimate the impact these fun recipes will have. Choose a few of your favorites and get your party menu together. You may want to try a few out before the party. However, these are so easy that there is not really any need to do that. You can quickly put these together in just a few minutes. Not only are they easy but they require very little money to make. Many of these can feed a crowd and really stretch your party budget. It’s a win all around for everyone. 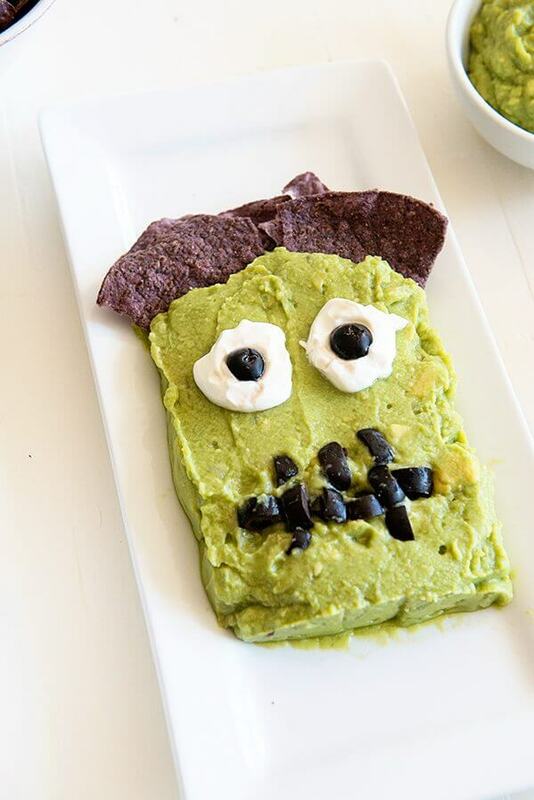 Let us know which Halloween recipes for appetizers you try. They are sure to be a hit. Find 20 fun printable Halloween decorations that will get your house ready for Halloween.